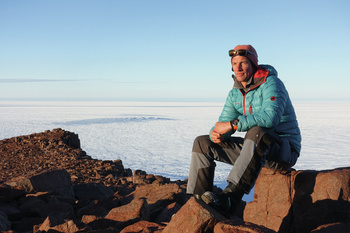 Martin Leitl wore the EZM 12 on his second research expedition to Antarctica. Although the GPS is showing 9 p.m., it’s as bright as day. According to the geographic coordinates, Martin Leitl was actually on the continent of Antarctica, the southernmost continent on Earth. It contains the South Pole and is situated amidst the Antarctic, fenced by the Antarctic Circle, to which it is often commonly referred. 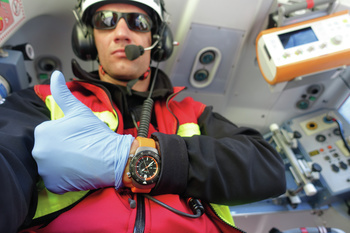 Emergency doctor Martin Leitl on board the fully equipped rescue helicopter, wearing the EZM 12. The rescue helicopter is in operation all year round – day and night. For complicated mountain rescues, a specially trained mountain rescuer is also on board. Besides being an emergency doctor, he is also an internist, a Master of Peace and Security Studies, as well as a state-approved mountain and ski guide. Martin Leitl refers to himself as ‘a totally regular guy with a rather unusual background’. That’s for sure! For behind such impressive titles lies an eventful life story. Born (in 1975) and raised in Plattling on the edge of the Bavarian Forest, he was forced out into the big wide world after completing his national service and medical studies: accompanied by his rucksack and like-minded people, as a volunteer on deployments abroad with the German Armed Forces (ISAF, KFOR), and with the humanitarian organisation Doctors Without Borders. The list of countries he has visited over the years is impressive (see info box). Those who read it invariably find themselves picturing Martin Leitl as an inquisitive, open-minded individual. Yet he doesn’t consider himself a daredevil or extreme adventurer. One thing that has remained constant throughout his life is his great interest in a wide range of activities and a passionate curiosity of the world, which he has always followed. His keenness to travel no doubt came from his father, who led the expeditions of the local Alpine association into the wilds of Kurdistan, across the Ararat towards West Greenland. Martin Leitl with a patient on the mountain rope. Since the helicopter used for this rescue mission is not equipped with a winch, a suitably long fixed rope is used. 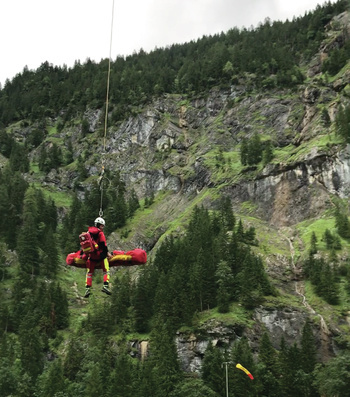 Sometimes, pitches up to 200 metres long are required for such rescue operations, which put all of the pilot’s helicopter flying skills to the test. Remarkably, it is this curiosity that continued to draw him to conflict zones, in particular, in Africa and the Middle East. Why is that? ‘Naturally, I wanted to help. At the same time, I wanted to find out what was actually behind these conflicts. How do these people think and feel? I wanted to get to know the countries first-hand and see things from my own fresh perspective. You can only truly understand why something has happened once you are actually there. Whether as a private individual, a medic or an aid worker’, he says. However, the constant commute between his home and distant lands, not to mention some of the terrible experiences he went through on foreign missions, left their mark – gradually leading him to rethink things. Is this life really good in the long run for my inner equilibrium? Am I all too often looking into the darkest abysses of humankind? Is a ‘career’ in humanitarian aid really the ultimate goal under such circumstances? Martin Leitl found his own answers. His retreat and destination for his recreational activities have always been the mountains; they are the second constant in his life. Even as a child, he accompanied his mountain-loving parents on long hikes. He was skiing at an early age. So why not turn his hobby into a profession? Which is why he now lives and works in the Bernese Oberland – maintaining a healthy balance between working primarily as an emergency doctor on the rescue helicopter in winter and mostly as a mountain guide in summer. Aside from his keenness to travel, another thing has always fascinated Martin Leitl: mechanical watches. To him, they are quite literally an expression of craftsmanship, soul and quality. He believes mechanical watches to be very personal items. They are a joy to wear and something that can be passed down to future generations. His quest to find a reliable watch led him to the EZM 12, a mission timer specially designed for the air rescue service and thus ideal for an emergency doctor such as himself. He appreciates the watch’s durability, functionality and focus on the essentials. ‘The EZM 12 is well designed and very harmonious, especially in terms of functionality’, he says in summary. ‘It’s a pleasure working with the watch. The time measurement function with count-up inner rotating bezel and countdown outer rotating bezel makes it especially easy to use.’ After all, every rescue mission is a race against time. Wherever a rescue helicopter lands, every minute counts. ‘When did I get to the patient? When did I administer medication? How long did I spend resuscitating? As an emergency doctor, these are all questions that need answering fast. This makes it all the more important to be able to keep an eye on the time. The EZM 12 optimally assists me’, says Martin Leitl, highlighting the benefits of this powerful tool for his work in mountain rescue. In other words, optimal conditions for the EZM 12 to prove itself on another extraordinary mission. For Martin Leitl went on a second mission to Antarctica, once again on behalf of the Alfred Wegener Institute. His skills as a doctor and mountain guide were put to the test on this research expedition, too. 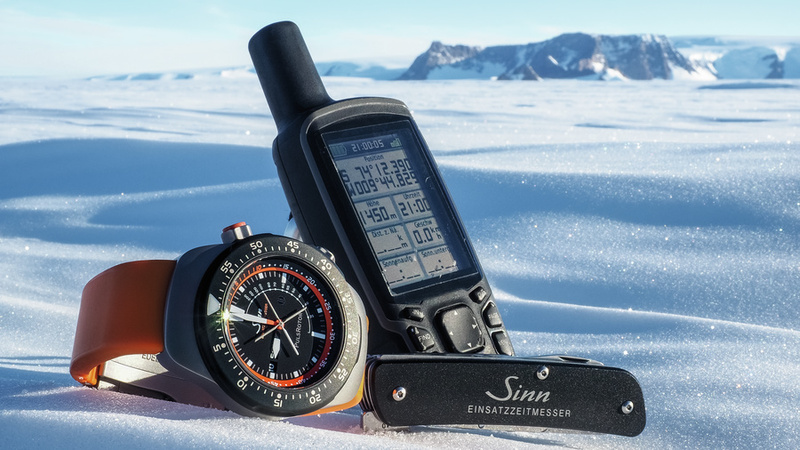 Another mission timer also weathered and ultimately succeeded brilliantly in mastering the extreme conditions: the EZM 10, which accompanied him on his first research expedition to Antarctica. Martin Leitl on a rocky island in the perpetual ice of Antarctica. He himself refers to it as an infinite ‘open-air monastery’, which allows you to focus on the important things in life. This is his second visit to the continent on behalf of the Alfred Wegener Institute. Accompanied by the EZM 12. Martin Leitl has seen much of the world, with all its beauty and fascination – but all too often things that also weigh heavily on the heart and soul.